Hollybeary Creations : NND Day 3 Reveal!!! Happy Wednesday everyone.... 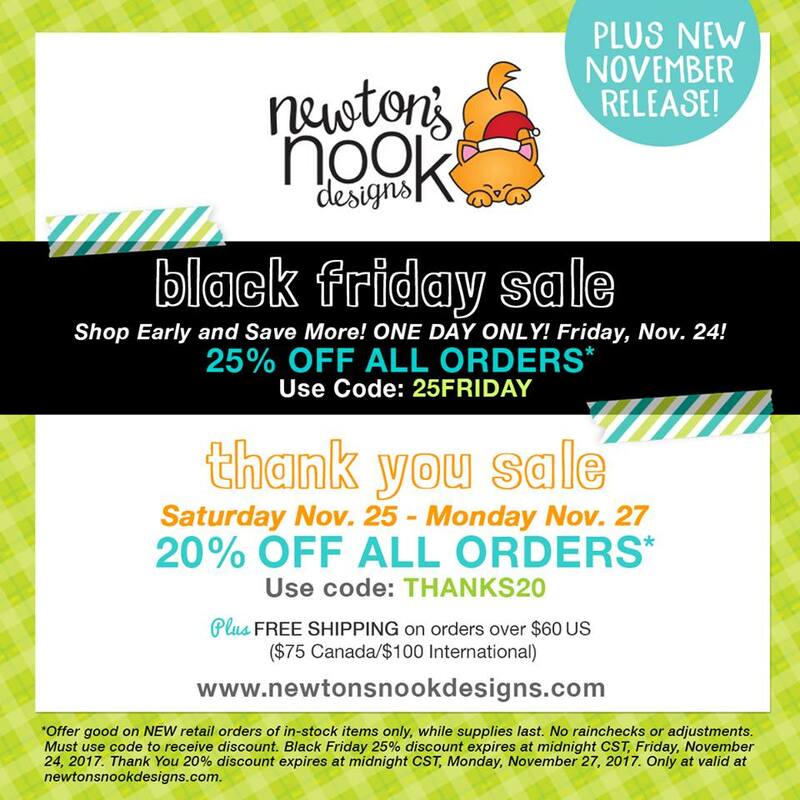 It's the final day of the Newton's Nook November Release Sneak and today we are revealing two stamp sets and their coordinating dies. Both of these sets are adorable... I paired both of the images with some Fun Christmas Paper from Doodlebug Designs and used colors that coordinated with the Papers. I created a scene with the Land Borders Die set and the smaller images in the set. I colored the images in with Copics and I added some Sparkle with a Clear Wink of Stella Pen. 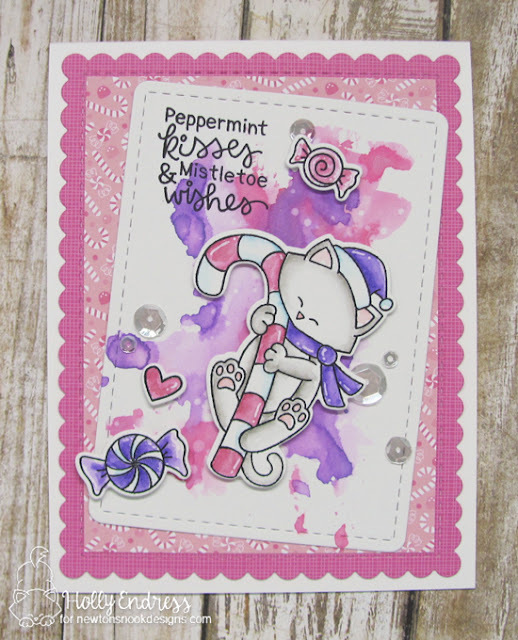 My second card features Newton's Candy Cane set. I created a Fun watercolor splash background with some Distress Inks and then I used the Frames and Banners Die set as well. I colored all the images in with Distress inks and I added some White Highlights with a Gel Pen. 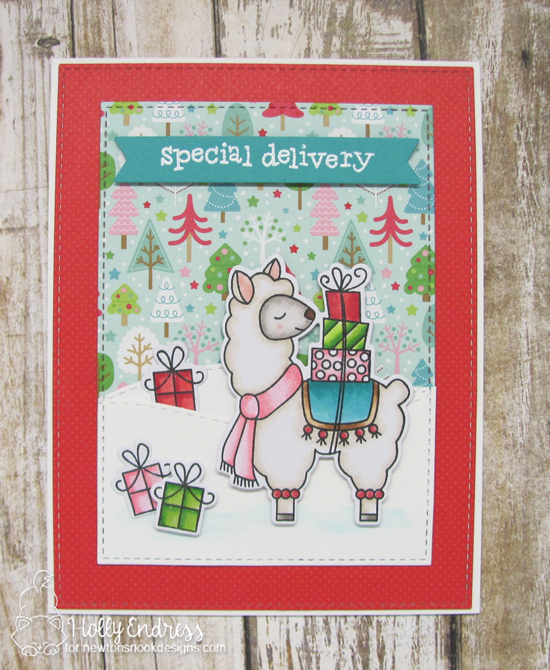 Would you like to win the “Llama Delivery” or the “Newton's Candy Cane” Stamp Set? All of the products from this release will be available in the store on Friday, Nov. 24th and be sure to Join us on Black Friday and Cyber Monday for some Great deals!!! Oh my!!! Beautiful stamp sets!!! I love so much how you use them to make these adorable cards!!! Your colouring make me dreaming!!! Both of your cards are so cute! I just LOVE that LLAMA! He is so festive and fun! Adorable! How sweet, love your color choices! Love your non-traditional colors for the holiday cards. Great inspiration - thank you! Fantastic cards! Love the background paper you used for the llama! And your kitty is wonderful - love the colours! The cards are stunning! Love the colors and designs. Both cards are wonderful! I really like your choice of colors. Love these new sets! 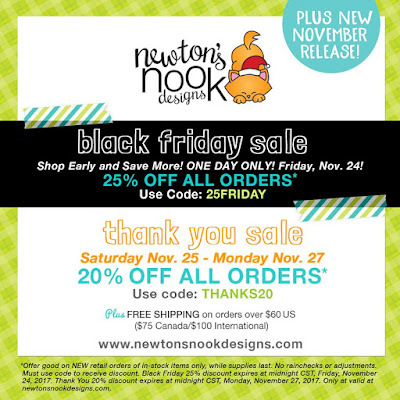 The llama is adorable, and of course Newton is a favorite! Fabulous cards! Love your pretty coloring! Great cards, loving that color combo on Newton's card! Both of your cards are lovely - you really rocked the patterned paper pairings on these! I think I have the one behind the llama somewhere in my stash (MME?) The colors in that card are so pretty together, and pink & purple create a fun candy card as well! Thank you for all of the beautiful holiday inspiration! Love the lightly coloured llama against the colourful tree background on your first card. The colours on the second card are so bright and cheery. Love both of these sets but I guess I would say I like the Newton's candy cane the best. Great projects you all have done. I'm so excited..fabulous new products and beautiful work! cute cards. The paper is perfect on the llama card and I like the layers and colors on the Newton card. 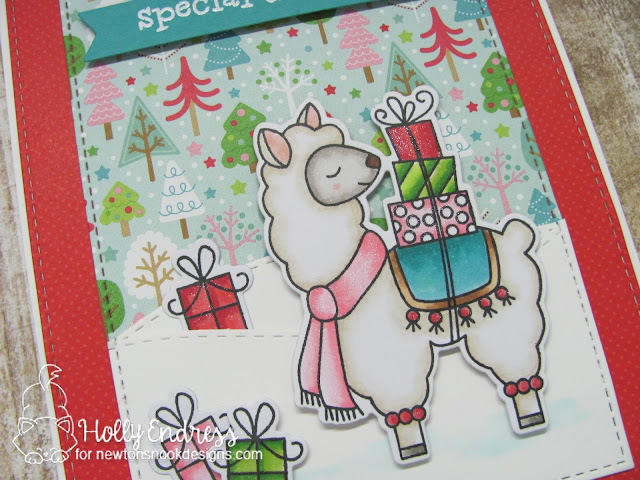 That llama is sooooooo cute, but your Newton's Candy Cane card has stolen my heart! I'm sold! LOVE this release! 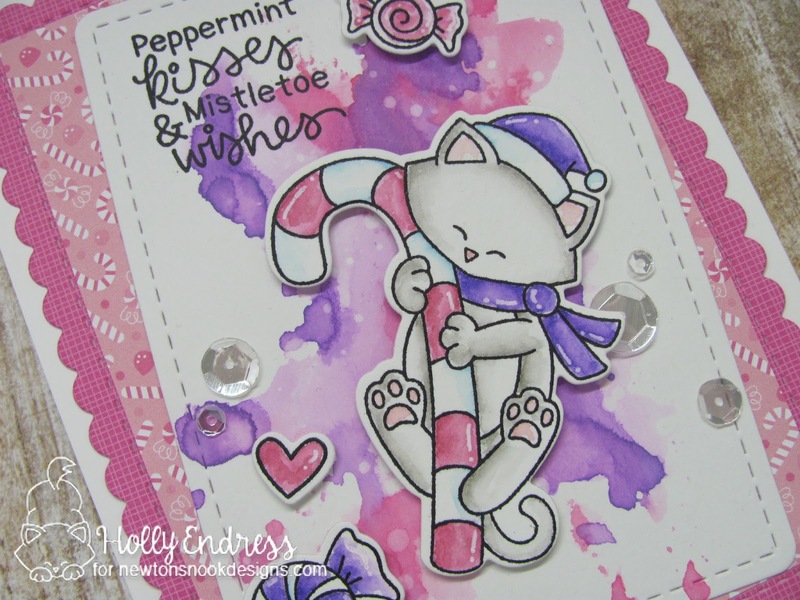 Your pink and purple card is very creative in the colors you picked! These are adorable! I love the pink and purple inky background and your awesome coordination of coloring and paper with the llama set. So, so cute. Adorable cards! Love the coloring on both and the non-traditional colors of the second. I adore the colors in your llama card! The Newton candy cane sample is awesome with the shades of purple! Good job, Holly! Love the nontraditional colours...cute images.